To be perfectly honest, $40 is a ridiculously good price for the best-selling over-ear Bluetooth headphones on Amazon. 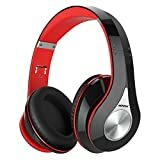 The Mpow 059 Bluetooth Headphones offer great sound, impressive battery life, and sleek styling, all for $160+ less than comparable headphones from Beats. As if $40 wasn’t cheap enough, Amazon’s running a little sale right now that drops the price to just $34.99 with free Prime shipping. Seriously, what are you waiting for?